Mohammed Morsi, then Egypt’s president, said in June “Egypt is a gift of the Nile, and the Nile is a gift of Egypt,” and promised that he was ruling no options out concerning that river’s future. This reaction to the decision to construct the Grand Ethiopian Renaissance Dam on the Blue Nile is unsurprising, since life in Egypt is dependent on the river. “Ethiopia is not intimidated by Egypt’s psychological war and will not halt the construction of the dam for a second,” the Ethiopian foreign ministry spokeswoman Dina Mufti said the next day. Her country does not accept that Egypt has historic rights over the waters of the Nile and refers to “illegitimate colonial rights”. Ethiopia, though ignored and even scorned for the past two centuries, is the source of 80% of the Nile’s waters and now intends to impose its own vision for the river and a different division of its waters. Egypt, having been the dominant power in the region for 200 years, is still reeling from recent political upheavals, economic weakness and the interruption of its development — all of which reduce it to the status of one Nile state among many, without the capacity for action. Egypt is entirely dependent on other states for its water, almost all of which comes from the Nile. Its four principal sources rise several hundred kilometres beyond Egypt’s southern border: the Blue Nile, Sobat and Atbara in Ethiopia, which provide around 80%, and the White Nile in Uganda, which provides the rest. Egypt’s share of Nile water has until now been regulated by a 1959 agreement with Sudan, under which Egypt gets 55.5bn cubic metres a year and Sudan 18.5bn. (The annual flow averages 84bn cubic metres, 10bn of which evaporate from Lake Nasser, created by the construction of the Aswan Dam, which came into operation in 1964.) This agreement allotted nothing to Ethiopia and other upstream states. The prospects for maintaining longer-term availability of water in sufficient quantities are poor. If the short-term prospects for improving resource management seem limited, the only possibility would be to construct a series of large-scale hydraulic engineering projects that would mostly depend on the goodwill of the countries controlling the river’s sources. But Ethiopia is opposed to any joint hydraulic project before a new water-sharing agreement is signed. In 2010 Ethiopia secured a treaty reorganising water-management and construction projects, the New Nile Cooperative Framework Agreement. Burundi, Kenya, Uganda, Rwanda and Tanzania are signatories. Under this treaty, a commission representing all the signatories will approve (or reject) large-scale hydraulic projects, dams, canals and anything else that has an impact on the course, volume or quality of the Nile’s waters. This alliance between six of the nine members of the Nile Basin Initiative — the forum in which Nile states try to find practical solutions and formulate joint projects (1) — has shaken things up in the region. Egypt refused to sign without an undertaking from the signatories not to alter the current division of the water and to recognise the “historical rights” of downstream nations (Sudan and Egypt). It now finds itself without any right of inspection in the Renaissance Dam project — a source of discord — and, for the first time in its history, without a right of veto, which it had thought innate. The choice of name for the dam is no accident. Ethiopia’s renaissance as a regional power is under way, strengthened by assets it has hitherto lacked. We are witnessing the emergence of a strong Ethiopia capable of playing a key geopolitical role in its zones of influence: the Red Sea, the Nile basin and East Africa. Ethiopia has flexed its muscles twice in the past 30 years. 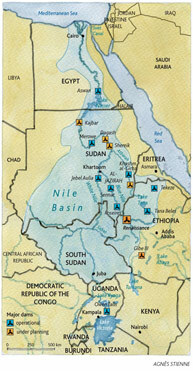 First, in Sudan in 1983, it reacted to the construction of the Jonglei canal — when 150km out of a planned total of 360km had been completed — by reigniting the war between north and south Sudan (the latter independent since 2011) as well as harbouring and arming John Garang’s Sudan People’s Liberation Army. In Somalia, Ethiopia was heavily involved in the civil war against so-called Islamists, supported by western powers keen to prevent the emergence of an Islamist state at the mouth of the Red Sea. China’s arrival in the region has freed Ethiopia from having to observe conditions imposed by the US and international financial institutions, including the need to seek agreement from all the countries with territorial water rights — especially Egypt — before receiving funding for major hydraulic projects on the river and its Ethiopian sources. Ethiopia’s diplomatic successes, such as the alliance with five other upstream states in the New Nile River Cooperative Framework Agreement, have given it the opportunity to escape hydro-political isolation. These successes are all the more remarkable since Addis Ababa has gained two significant strategic allies: the new state of South Sudan (2), which is about to sign Ethiopia’s new Nile water treaty; and more astonishingly, Sudan itself, which has traditionally allied itself with Cairo in Nile politics. Sudan is hoping for benefits: electricity; increased irrigation capacity and joint large-scale agricultural projects with Ethiopia (while the prospects for using the water from the new reservoir in Ethiopia are limited because of the nature of the terrain, Sudan, which is downstream of the dam, has vast areas of irrigable land); and mitigation of its severe flood problems, especially in the east, the agricultural Al-Jazirah region, and greater Khartoum. Through the Renaissance Dam and its huge electricity generation capacity (around 6,000 megawatts from 2015/16) Ethiopia will achieve considerable energy self-sufficiency and even become an energy exporter to the region, particularly the Sudanese states and perhaps even Egypt. Given its location, it would be hard for the dam to be part of the development of irrigation and agricultural production on the high plateaux upstream and in southern and eastern parts of the Ethiopia. But some of the water held in the dam, which could have a capacity of 63bn cubic metres, is likely to be used to create new irrigated areas around the lake, downstream of the dam — some studies suggest half a million hectares (3) — and in Sudanese territory, with cooperation. The Ethiopian leaders’ ambition is to make their country a major regional power, an exporter of electricity and a producer-exporter of agricultural products and foodstuffs. (1) It also includes Egypt, Sudan and the Democratic Republic of the Congo. Eritrea has observer status and the new state of South Sudan is scheduled to join the forum this year. (2) See Jean-Baptiste Gallopin, “Sudan’s fractious pair”, Le Monde diplomatique, English edition, June 2012. (3) “Grand Ethiopian Renaissance Dam Project, Benishangul-Gumuz, Ethiopia”; water-technology.net.